I love Magpie, who produce beautiful homeware and gifts. 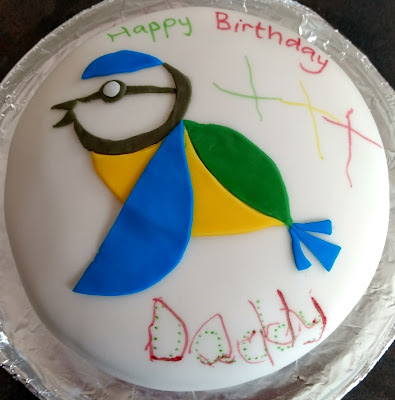 Their "Birdy" range is probably my favourite and it is this range that inspired my decoration of my husband's birthday cake this year. I have to admit that it was a bit of a rushed job and I should have used templates rather than cutting freehand and hoping it fitted together but you can at least tell what it's supposed to be! Jessica and I used edible ink pens to do the writing, which was nowhere near as easy to use as I had hoped because the icing was fairly soft so the nibs sank in if you weren't really light-handed. Jess loved the cake and couldn't wait to tell Daddy all about it. So much for surprises hey! Happy birthday, David!